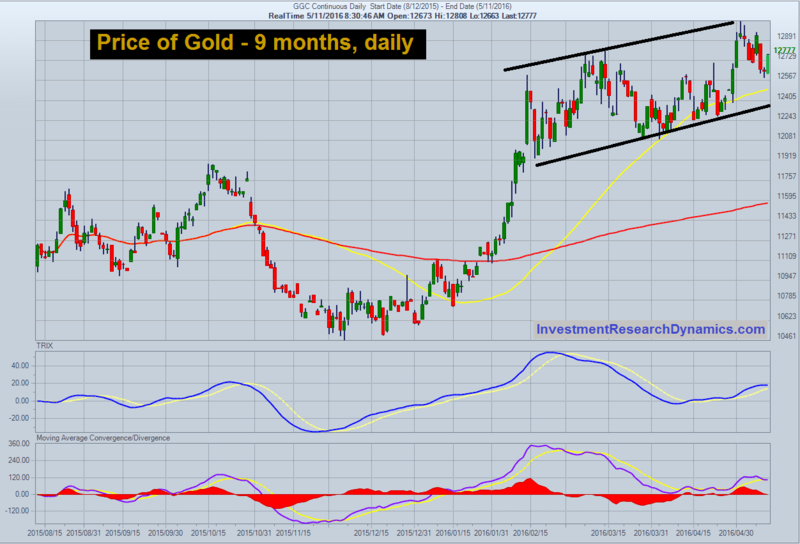 We expect that a significant bull move will occur and a significant amount of capital will pull out of “risk assets” and move into physical gold and silver for wealth preservation/flight-to-safety. 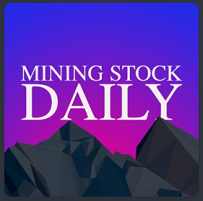 Mining Stock Daily is produced by Clear Creek Digital and the Mining Stock Journal. Western Copper was a spin-off from Western Silver after Glamis Gold acquired Western Silver in May 2006 (three months later Goldcorp acquired Glamis). WRN acquired the old Lumina Resources in September 2006 for Lumina’s three copper properties, one of which was Casino. WRN spun-off the other two properties. WRN only has 106.4 million fully-diluted shares outstanding (including options/warrants), which is remarkable for company that has been developing a massive copper-gold project for 11 years. Insiders own 8% of the stock. A small group of high net worth private investors who have made a lot of money on companies run by WRN Executive Chairman, Dale Corman, own 48% of the stock and institutional/retail own the remaining 44%. WRN raised $32 million in 2012 selling a Net Smelter Return royalty to Orion Capital. That NSR was sold to Osisko in June 2017 when Osisko acquired a portfolio of royalty assets from Orion. With a market cap of US$70 million (fully-diluted basis), WRN is extraordinarily undervalued on a risk-return basis. This is especially true considering the recent wave of copper-gold porphyry project M&A activity. Recall that Newcrest invested approximately US$14 million for a 19.9% stake in Azucar’s El Cobre, which valued that early-stage copper-gold project at US$74 million. In 2017, Goldcorp paid US$185 million for Exeter’s Caspice copper-gold project high up in the Chilean Andes. There have been several other transactions in the copper-gold space, including Zijin’s (Chinese company) acquisition of Nevsun for $1.41 billion (September 2018) for the Timok copper-gold project in Serbia and the recently closed sale of the Malmyzh copper-gold project (Freeport, EMX Royalty) to Russian Copper Company for US$200 million. WRN’s project is not as large or as high-quality as Malmyzh, but it’s several years closer to being converted into an operating mine. At this juncture, with the current price of copper and gold, the “asset value” of WRN, based on the roster of comparable transactions, is at least US$140 million. I would not be surprised to see one of the companies with projects near Casino make bid a for WRN at some point in next 6-12 months. There’s also a list of other potential acquirers, including RioTinto, BHP and Freeport. Patrick Vierra of Singapore Bullion invited me to discuss precious metals, the stock market and the fiat currency-fueled asset bubbles that will blow-up sooner or later. I explain why investing in gold requires a long term perspective on investing and wealth preservation, why gold and mining stocks are extremely undervalued right now and why the world wants out of the U.S. dollar. 08:14 Was 2015 the bottom for gold price? 41:09 Fed rate hike to prick the housing bubble? The Mining Stock Journal is twice per month, every other Thursday evening. 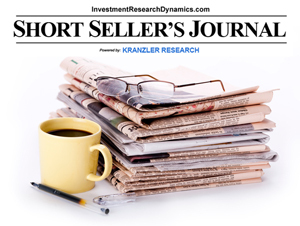 The Short Seller’s Journal is weekly, every Sunday evening. The last mining stock purchase recommendation (May 17th issue) is up 10.5% in the last five trading days. It’s going higher – a lot higher. My Short Seller’s Journal subscribers have been raking in the profits in my homebuilder short ideas. Some geologists believe that the Cortez Trend could be bigger than the famed Carlin Trend. U.S. Gold has a project that sits about 10 miles south of Barrick’s mammoth Cortex Hills gold mine. I’ve spent about five hours with the CEO and co-founder – in person and on the phone – and over two hours in person with the head geologist understanding why USAU’s Keystone Project has potential to be the next big gold discovery in Nevada. For Mathewson, the key to starting the hunt for a deposit is to find areas with the “right host rocks.” With Keystone, it has “rocks, system and geological characteristics – nothing is missing.” The “scout holes” drilled by the Company were used to identify the “stratigraphy,” which shows the geological layering of the rock formation and can help identify gold-bearing formations. According to Mathewson, the stratigraphy of Keystone looks almost exactly like Barrick’s Cortez Hills property stratigraphy – but even better. I first presented U.S. Gold to my Mining Stock Journal subscribers in mid-November at $1.45. It has traded as high as $3 since then. The latest pullback in price is a great entry point. 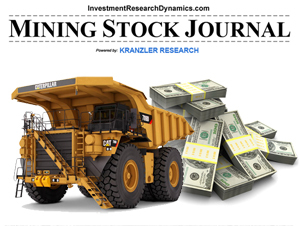 The Mining Stock Journal has had several home run stocks since it’s inception. You can learn more about this newsletter here: Mining Stock Journal information. Novo is not worth the $544 million market cap based on Friday’s close using fully-diluted shares. Novo might eventually be worth $600 million or even more. But that reality is several years away. I have been recommending selling to my Mining Stock Journal subscribers for several months. I don’t just ideas to buy, I help my subscribers avoid stocks that are overvalued, for whatever reason. Novo Resources is a Vancouver-based junior mining exploration company that is in the early stages of exploring its Karratha gold project in Australia. It also has another gold project, Beatons Creek, in Australia and a property in Nevada. Novo had an extraordinary run in price starting in early July, when it ran from 63 cents (US$) to US$7 by the early October. At its peak valuation, its market cap was $1.39 billion. The stock began to head south after hitting $7. It plunged nearly 29% today (Dec 21) after releasing its latest exploration update. Lior Gantz of the Wealth Research Group invited me onto this show to review Barrick Gold as an investment. It was an interesting proposition because I was not given advance notice in order to prepare notes or review Barrick’s financials. The exercise forced me to focus on an overview of my reservations about the quality of Barrick as an investment and point to the critical financial metrics I review when doing a “drive-by” analysis of a prospective mining stock investment. Investing in the largest mining companies is like investing in IBM instead of the promising emerging technology stocks during the 1990’s technology revolution. The best geologists at the big companies, after they’ve reached a level of financial security, leave to develop new gold and silver projects that are often overlooked or rejected by the big companies. These are the types of investment opportunities that offer the best upside in the sector and these are the opportunities that present in the Mining Stock Journal. In the last 8 weeks two of the companies presented in the Mining Stock Journal have agreed to be acquired (Exeter Resources and Mariana Resources). Silver Doctors / The News Doctors invited me onto their weekly SD Bullion Metals and Markets show to discuss why both the technicals and fundamentals are setting up for an unexpected rally into the summer in gold, silver and the mining shares, specifically the juniors. Subsequent to our recording, the weekly Commitment of Traders report released Friday showed that the bullion banks continue to cover their net short positions in both gold and silver rather aggressively and the hedge funds are unloading long positions and piling into the short side. Historically, this has been a set-up for big moves higher in the sector. The hedge funds chase momentum and they are almost never right in the precious metals sector. When they pile into short positions, like they are now, it’s always a valid contrarian indicator. 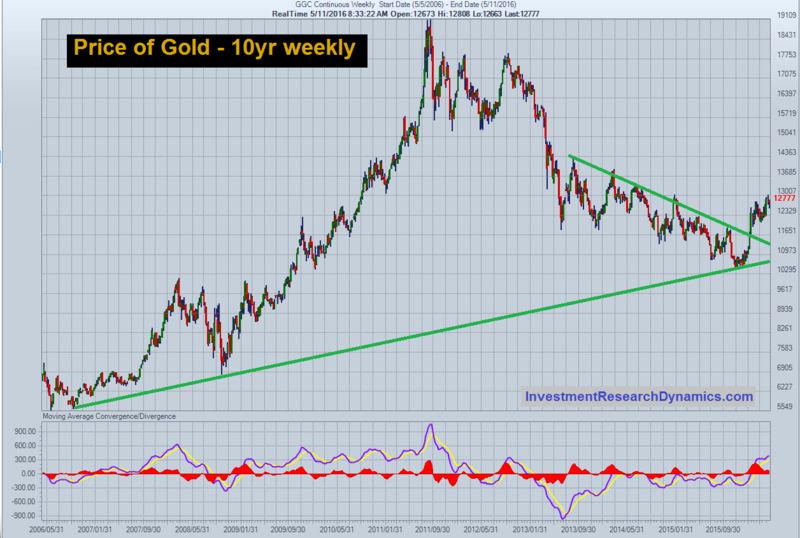 We also discuss why the “summer doldrums” in the precious metals sector is no longer a valid seasonal play. Another contrarian indicator is the negative sentiment connected to the GDXJ ETF. Adam Hamilton wrote a non-compelling critique of GDXJ and made the assertion that GDXJ was diverting the flow of capital away from junior companies that deserve to get funding. The problem with this analysis is that retail investor buying of junior mining stocks on the secondary market is not a source of capital for junior mining companies. The secondary trading of stocks is not a source of capital for any stock, for that matter. ETFs are a “derivative” of the secondary trading market and thus are also not a source of capital for companies. Junior mining stocks get their capital from new share issuance or from direct investment by strategic investors. If Hamilton bothered to call on the companies themselves rather than take quarterly filings and throw numbers into a spreadsheet as his primary tool of analysis, he would discover that many junior exploration CEO’s would tell him that they are getting a lot interest from strategic investors. Furthermore, many junior mining companies with investment-worthy stories are having no problem raising capital through primary share-issuance, notwithstanding the recent turmoil connected to GDXJ. GDXJ is a derivative security. Derivatives are a source of fees for their issuer/sponsors, not a capital raising conduit for companies. The Mining Stock Journal focuses on the emerging junior exploration mining companies that are seeing an elevated level of investment interest from sophisticated private investment funds and from strategic investors. These are the stocks that offer the greatest upside-potential in the junior segment of the sector – not the larger-cap, developed companies in the GDXJ Trust. The latest issue features a company with a potentially prolific gold property that is in negotiations with a strategic investor. Two juniors featured in the Mining Stock Journal were acquired recently. Looking at companies one-by-one, not en masse, is how you find the potential home run stocks. You can learn more about investing in these opportunities here: Mining Stock Journal information. I’m not sure of the significance of 20 minutes past the hour, and I’m sure it has some sympbolic meaning to the gold manipulation cabal, but for the last week the price of gold has been getting slammed with an avalanche of Comex confetti at regular intervals at 20 minutes past the hour. THAT is not the graph of a market that is allowed to trade freely. But notice how gold bounces back sharply from every take-down attempt. This is especially significant given that this is one of the slowest seasonal periods of the year for the buyers of physical gold and silver. This morning (Tuesday morning) was particularly blatant. Gold had traded steadily higher overnight from $1344 (December futures basis) to $1364 just after the Comex floor opened for business (8:20 a.m. EST/6:20 a.m. MST). Whenever the elitists start to lose control of gold, they roll out one of their Fed stool pigeons to threaten the world with a 25 basis point (one quarter of one percent) rate hike at the next FOMC meeting (September). Today’s park bench popcorn scavenger was NY Fed President, Bill Dudley, who stated on Fox Business that a rate hike in September is “possible.” I guess that means September’s meeting is a “live meeting” – a phrase Dudley and SF Fed Prez, John Williams, propagated the mainstream media propaganda meat grinder with in May – LINK . But gold shrugged off Dudley’s empty, Straw-man threats and closed today respectably up about $5 from the close of yesterday’s afternoon “access market” trading session. I still believe that gold could see $1500 by Halloween despite the Comex B-52 paper bombs being dropped religiously on the market. And we are just one economic, political or societal catastrophe from gold making a rapid run toward $2,000. Buy every manipulated sell-off in gold and silver. It’s the true “TINA” idea. A lot of readers have asked me if it’s too late to buy mining stocks at this point. I refer them to a long-term graph of GDXJ so they can see where the junior miners have been relative to the level at which they bottomed. It’s a prototypical chart of a market that is in the early stages of a massive move higher. The key is to identify the exploration companies that have a high probability of hitting the proverbial pot of gold. The last 5-years caused a lot of damage to the junior sector, but there’s a lot of companies with “a pulse” that have been revived, albeit significantly undervalued from a risk/return standpoint. 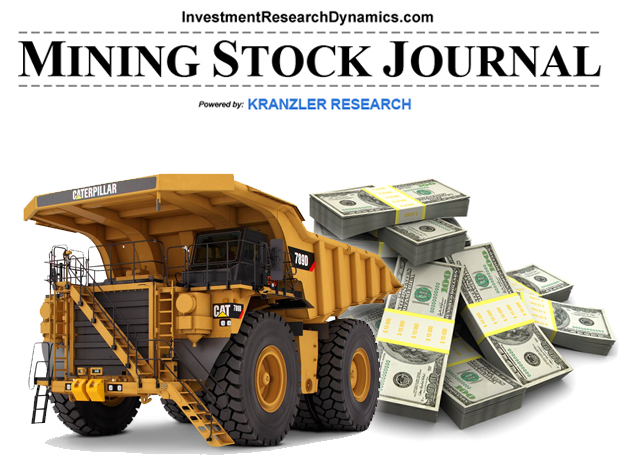 My Mining Stock Journal is focused on finding companies that are currently overlooked by the mainstream mining stock analysts and newsletters. As an example, I presented a stock idea in mid-April that is up over 280%. It recently doubled in price shortly after a major newsletter service poo-poo’d the idea. I draw on several seasoned veteran contacts plus 15 years of experience researching and investing in this sector. You can access the MSJ – a bi-weekly report – here: Mining Stock Journal. James: Dave: Thanks for all you do. I’ve purchased your stock briefs and have made some nice profits. This junior gold miner has nearly 5 million ounces of gold in a prolific gold mining district in Canada. The gold resource is one of the largest gold deposits discovered in the last 15 year. It is joint developing this project 50/50 with a mid-sized mining company that has deep pockets. This project has a very high probability of being successfully advanced into a big gold mine. This Company also has some projects in Nevada with huge upside potential. I doubt this Company will be independent by the time those projects reach an advanced stage.